Manjadi… the tree, the seeds and a story…….. I would not dare to insult the intelligence of my contemporaries who spent their childhoods roaming the green and verdant landscape of rural Kerala in the Seventies and Eighties by asking whether they remember these rubies! But those gentle readers who might not have grown up in tropical Kerala (or similar hot, humid and rainy climes) and do not recognise them, please read on! The treasure of many a school kid- guarded, hoarded, traded, played with. 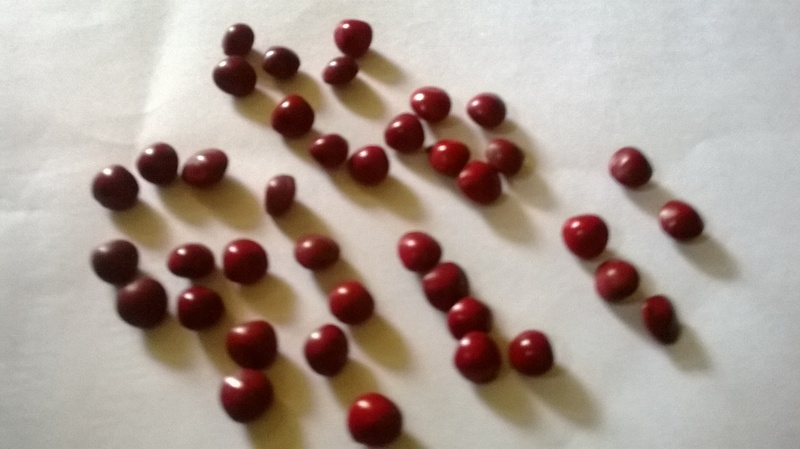 These are called “Manjadi kuru(s)” in Malayalam, shining scarlet red seeds of the Coralwood/ Red Sandalwood tree (Botanical name: Adenanthera Pavonina and Sanskrit names Kuchandana/ Tamraka), which generally grows wild. The sheer beauty of these seeds, combined with their relative rarity, made them coveted objects of desire for us. The rarity factor was because being a non-fruit bearing, large canopied tree, it would not find a place in any self respecting farmer’s land; especially in the village I grew up such trees would be found only in commons and by the sides of roads- they would also be for a long time the trademarks of railway stations, planted by the farsighted souls, who were responsible for the laying of the first meter gauge railway lines and construction of the railway stations in Kerala; For so many years after becoming an exile from my village, railway stations, with the huge gnarled and old trees, particularly the one with abundant yellow flowers (whose name I have never managed to find out yet) were the first joyous sight which greeted me on returning home as well as the last teary eyed sight on the journey back to college and later to the city of work. The roadside trees offered shady shelters to wayfarers in those days of scant or non existent public transport. Despite my true blue villager roots, the first Manjadi tree I must have seen in my life was while trudging along, weary, hot and thirsty at the Trivandrum Zoo, daughter in tow (she must have been four or five then, which made me somewhere in my early thirties). The zoo, established by the erstwhile king of the South Indian state of Travancore, abounds with many venerable old tropical trees, leafy and huge. The trudge was suddenly made eminently bearable by the discovery of these bright red seeds scattered on the ground, which were enthusiastically gathered by us. Legend has it that this is the only way one is supposed to gain possession of these lucky red seeds, unless one receives them as a gift. There is also an interesting fable behind the custom of having an Uruli (traditional circular wide mouthed and heavy bottomed cooking vessel made of Bell Metal, ethnic to Kerala) filled with Manchadi seeds in Krishna temples. The protagonist of the story is an old and poor widow who longed to visit the famed Krishna Temple at Guruvayur, but in classic Kuchela style, had nothing of value with her to take to the Lord. She chanced upon a Manjadi tree nearby and decided that since she had nothing else, she would collect its seeds as an offering for Him. She at last was able to make her trip to the temple, on foot, travelling many days, but as chance had it, that day also happened to be the one on which the local ruler, along with his retinue, was also visiting the temple, being the first day of the first month of the Malayalam year. His offering to the Lord is, as usual, an elephant. The temple officers, in their arrogance, are busy pushing and shoving ordinary mortals out of the way, so that the ruler can worship the Lord in peace and privacy. The old lady stumbles and falls to the floor, her pouch of Manjadikkurus open and scattered on the ground. Immediately the elephant goes berserk, trumpeting and running around destroying things. People run for their lives. The ruler and retinue are at a loss, shocked and numb at this twist. A voice is heard from the sanctum sanctorum- “Where are my Manjadikurus? Where is my devotee who has collected them so lovingly for so long? Why is she insulted and hurt?”. The old lady is found and her scattered seeds collected. Only after her offering of seeds is made to the Lord, does the elephant calm down. In memory of that unknown devotee the seeds are kept at the temple, probably as a reminder that no offering, if made from the heart, is too humble for Him. After those days, I was guilty of totally forgetting all about Manjadis for a long long time- for the simple reason that they did not feature anywhere in my horizon, living first in the city of Surat, a neo-modern place, a wannabe Bombay, ruthlessly erasing the old and beautiful Parsi residences to make way for box like flats, but not quite succeeding in capturing the essence of Bombay and then later, in Ahmedabad- more gracious and cultured, as well as the virtual capital of the Western Indian state of Gujarat. Gujarat has a hot and generally arid climate, with extremely hot summers and similarly cold winters, brief and heavy monsoons- all of which ensured that this tree is non existent in the state, at least in the part of the state I happened to live. So you can imagine my overjoyed reaction, when one rainy afternoon, I came across a profusion of bright red scattered seeds on the wet ground, in a remote corner of Tripura, last May! As is the fate of parents who hold transferable jobs, my husband and I find ourselves in the position of supplicants many a time, facing self important Principals, Headmasters (and Mistresses), even clerks, requesting application forms, an audience and the ultimate goal- a seat for one’s child in that particular school. Happening to be non-native Hindi/Gujarati/Bengali/ etc. etc. speaking outsiders, speakers of a strange and incomprehensible roll-in-the-mouth-all hard consonants-and-sharp vowels-language interspersed with Aiyos, and English, sometimes it is astounding to see the level of rudeness some of these people exhibit to such parents- already harassed beyond belief by a major life change, faced with uncertainties at work and life as a whole. A kind word, even if it is a No, would be so appreciable at that point of time. This was a similar occasion, but sans the rudeness and a pleasant experience in all, despite the negative verdict. Dejected and depressed, walking back to the gate , I found, like a small consolation gift, the wonderfully red manjadi seeds scattered all across the narrow, winding path. A small saving grace! A wonderful gift to take home to the children, who spent the day in a hotel room, in a strange and alien city, patiently waiting for their parents to come home. The guilt of being a working mother becomes unbearable at certain moments.